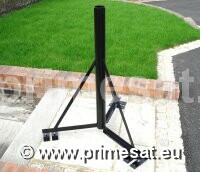 Primesat heavy duty ground stands for satellite dishes. 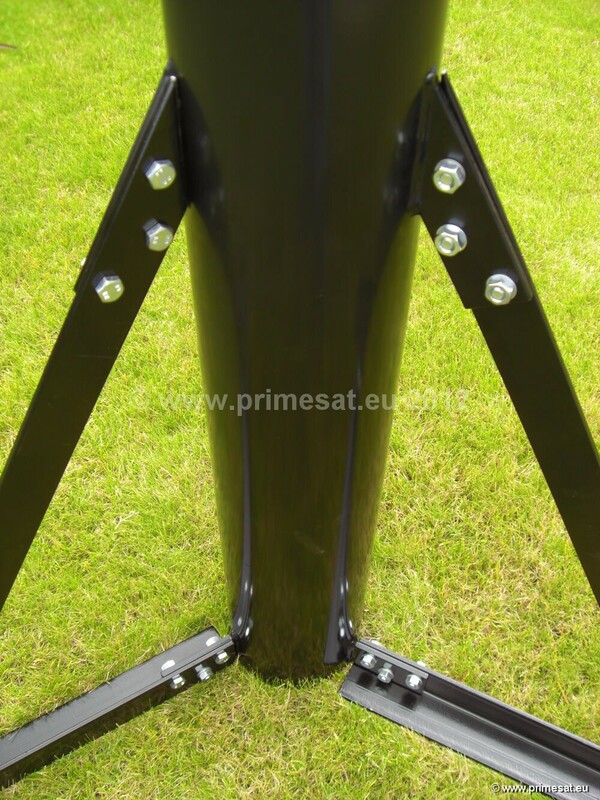 Satellite dish tripods and ground stands. 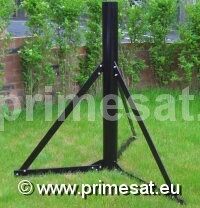 Primesat GS501FW3 heavy duty ground stand This stand is 1.0m high and has a 50mm (2.0") diameter vertical pole. Heavy 5mm thick angle is used for the base. Each of the steel 40mm by 40mm angles at the base are 500mm long. 3 adjustable feet are included. There are 2 bolt holes per foot so a there are a total of 6 bolt holes for fixing to the ground. The stand is fully welded. 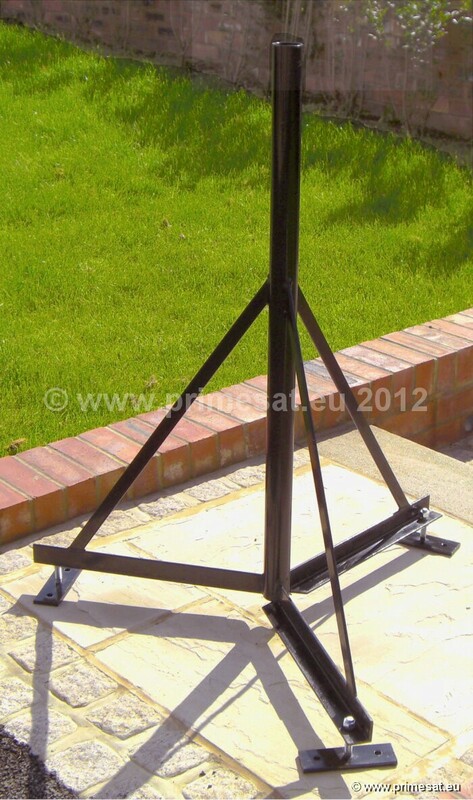 This fully welded stand will ship within the UK and usually within Europe without needing to be bolt together as it is not an oversized item. Weight 11Kg including 3 feet. This stand is also available without adjustable feet. The model number without adjustable feet is GS501FW Without the feet there are 6 bolt holes for securing to concrete or paving. 2 holes in each angle. Adjustable feet can be used for leveling and making the pole plumb (vertical). This is important if the dish is motorised. The stand is etch-primed, primed and top coated black. The paint coatings are oven baked at high temperature for durability. 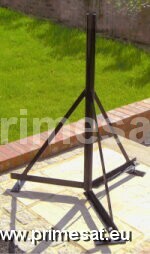 This stand is ideal for dishes up to 1.2m diameter and requiring a 50mm pole. Extra feet are available as an option. With dishes up to 1.0m only 3 feet would be needed but for 1.2m dishes an extra set of 3 feet is recommended. One set of 3 feet have part number GS3EF. We have manufactured these stands since 1991. 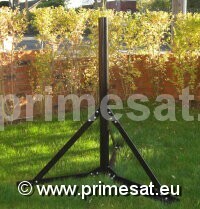 Primesat GS761FW3 heavy duty ground stand including 3 adjustable feet. 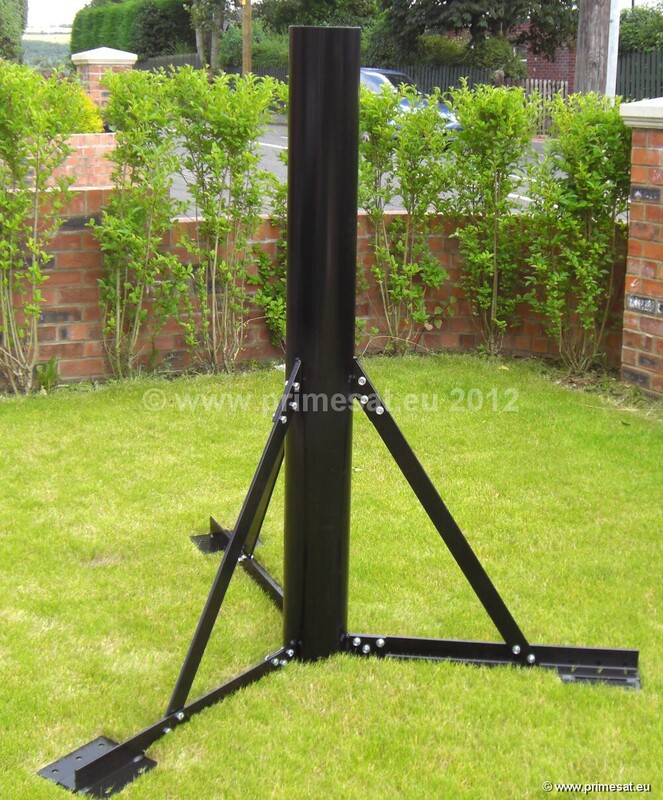 This stand is 1.0m high and has a 76mm (3.0") diameter vertical pole. Heavy 5mm thick angle is used for the base. Each of the steel 40mm by 40mm angles at the base are 500mm long. 3 adjustable feet are included. There are 2 bolt holes per foot or so a there is a total of 6 bolt holes for fixing to the ground. Adjustable feet can be used for leveling and making the pole plumb (vertical). This is important if the dish is motorised. The stand is fully welded. 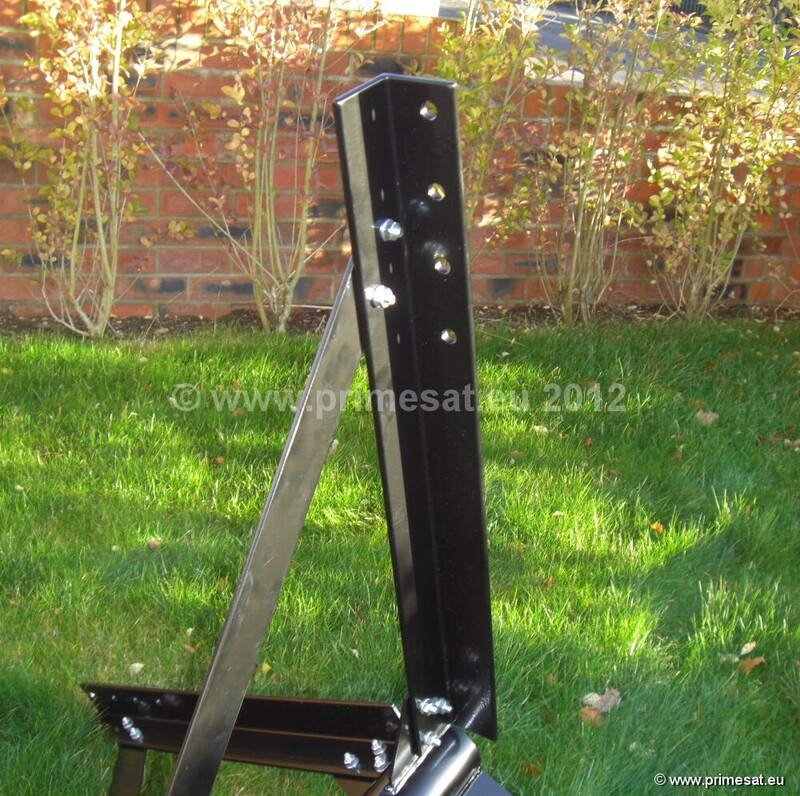 This fully welded stand will ship within the UK and usually within Europe without needing to be bolt together as it is not an oversized item. Weight 12Kg including 3 feet. 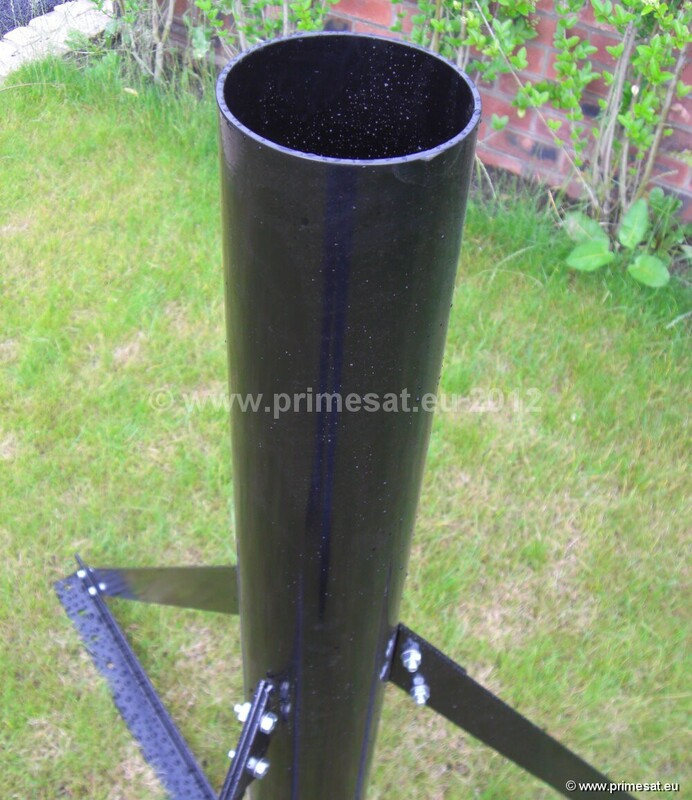 This stand is ideal for the 1.2m Raven dish (The Raven dish used to be called Andrews and before that Channel Master) and the 1.5m Gibertini dish and could be used to support other makes of dishes up to 1.5m or other applications. When used with 1.2m or 1.5m dishes it is recommended to use 6 feet as this increases the bolt hole ground fixings to 12. An extra 3 feet are available as an option. Part number GS3EF. 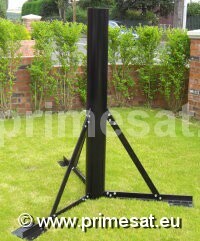 Primesat GS76125 heavy duty ground stand This stand is 1.25m high and has a 76mm (3.0") vertical pole. Heavy 6mm thick angle is used along the base and each of the steel 60mm by 60mm angles at the base are 675mm long. There are 12 holes for securing to concrete or paving. Four holes in each angle. The stand is etch-primed, primed and top coated black. The paint coatings are oven baked at high temperature for durability. Multiple bolts are used for maximum rigidity at all joints. Weight 27Kg excluding optional feet. The stand is heavy but it needs to be. Since it is bolt together it can be easily transported or shipped internationally. Adjustable feet are available as an option. With this stand 3 sets of 3 feet are recommended. 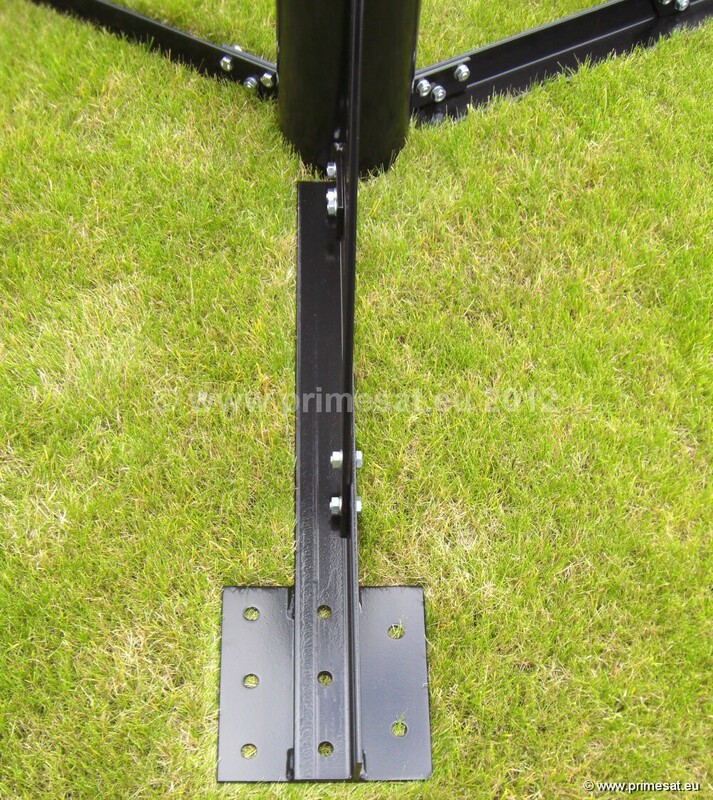 This provides 18 holes for ground fixing. One set of 3 feet have part number GS3EF. Adjustable feet can be used for leveling and making the pole plumb (vertical). This is important if the dish is motorised. Options. 1. Ballasts, total weight 52Kg, 2. Adjustable feet, 12 are needed. We have manufactured these stands since 1991. 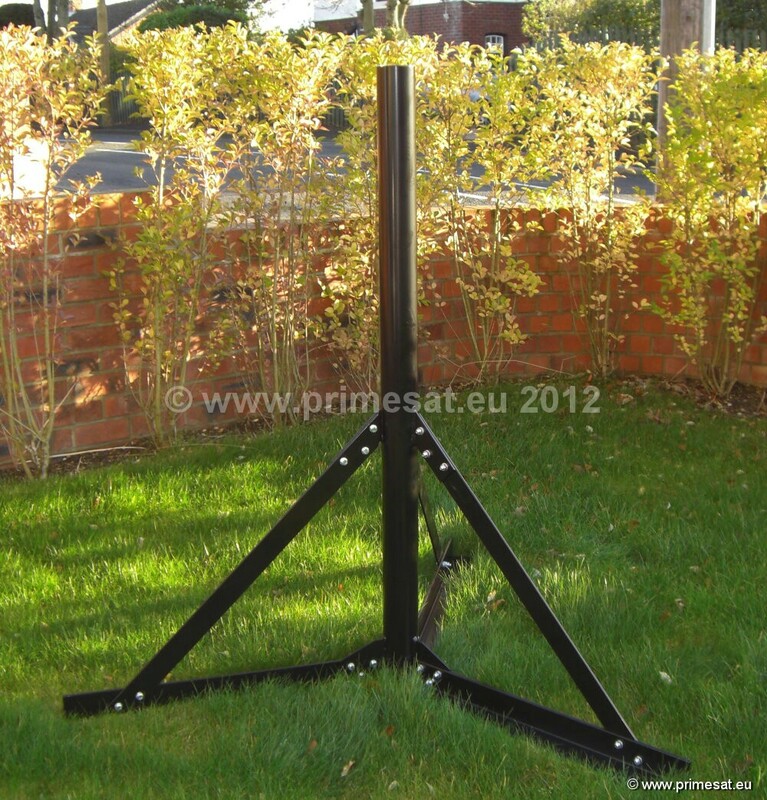 Primesat GS45125 heavy duty ground stand This stand is 1.25m high and has a 115mm (4.5") vertical pole. 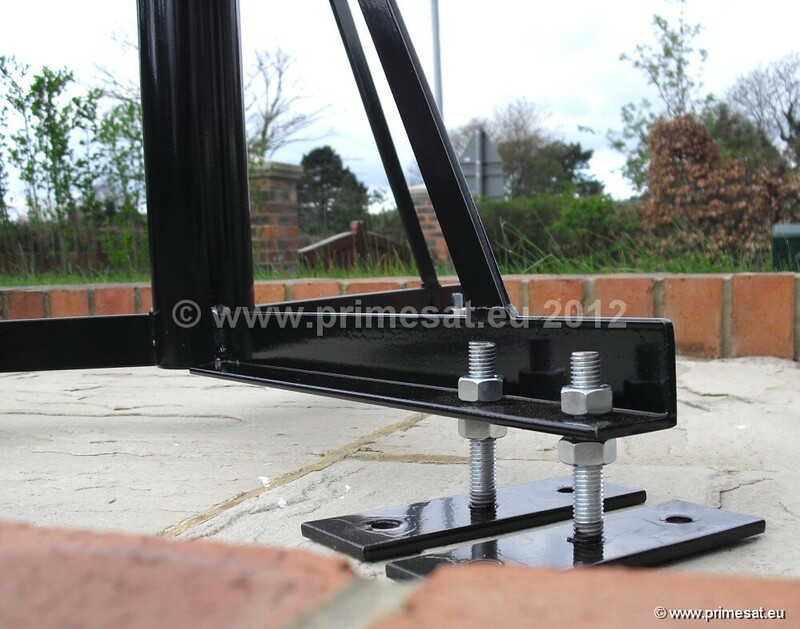 Heavy 6mm thick angle is used along the base and each of the steel 60mm by 60mm angles at the base are 675mm long. There are 12 holes for securing to concrete or paving. 4 holes at the end of each angle. The stand is etch-primed, primed and top coated black. The paint coatings are oven baked at high temperature for durability. Multiple bolts are used for maximum rigidity at all joints. Weight 45Kg. The stand is heavy but it needs to be. The pictures were taken in the rain so dots on the paintwork are just rain drops. Since it is bolt together it can be easily transported or shipped internationally. Options. 1. Ballasts, total weight 72Kg, 2. Adjustable feet, 12 are needed. We have manufactured these stands since 1991. 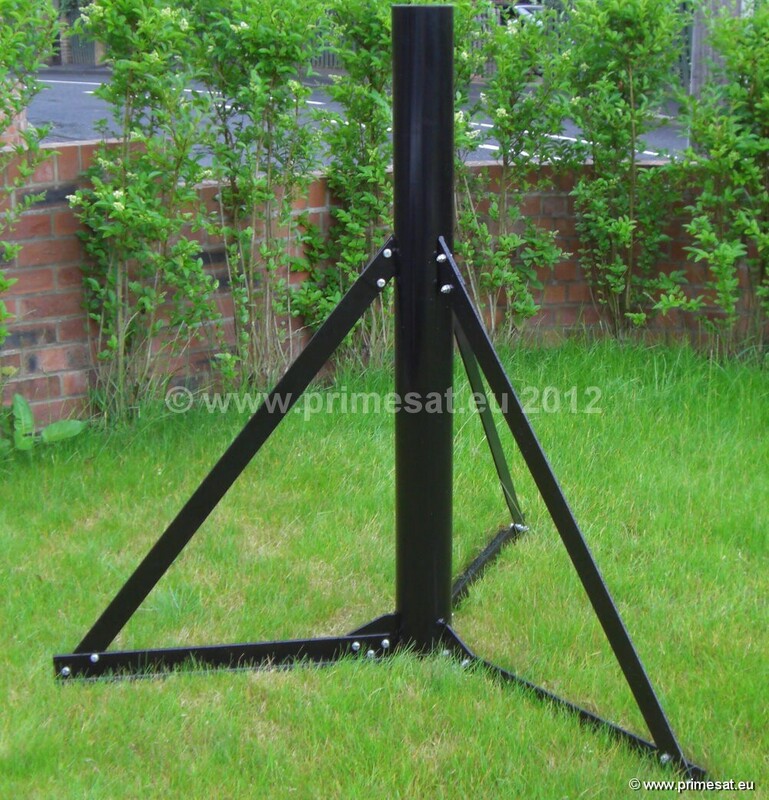 Primesat GS65160 heavy duty ground stand This stand is 1.6m high and has a 165mm (6.5") vertical pole. 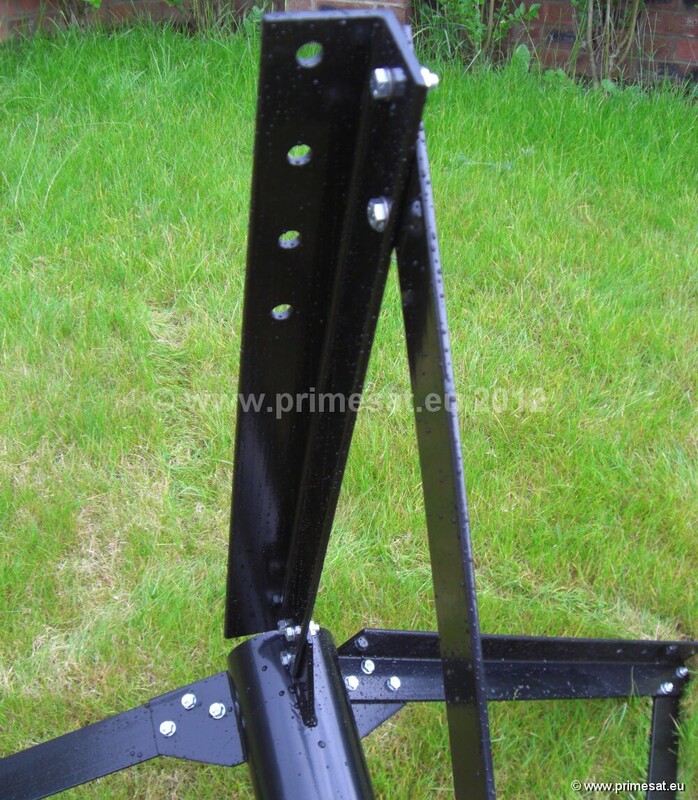 Heavy 6mm thick angle is used along the base and each of the steel 60mm by 60mm angles at the base are 850mm long. There are 24 holes for securing to concrete or paving. 8 holes at the end of each angle. The stand is etch-primed, primed and top coated black. The paint coatings are oven baked at high temperature for durability. Multiple bolts are used for maximum rigidity at all joints. Weight 77Kg. It is heavy but it needs to be. Since it is bolt together it can be easily transported or shipped internationally. Options. 1. Ballasts, total weight 99Kg, 2. Adjustable feet, 15 are needed. We have manufactured these stands since 1991. 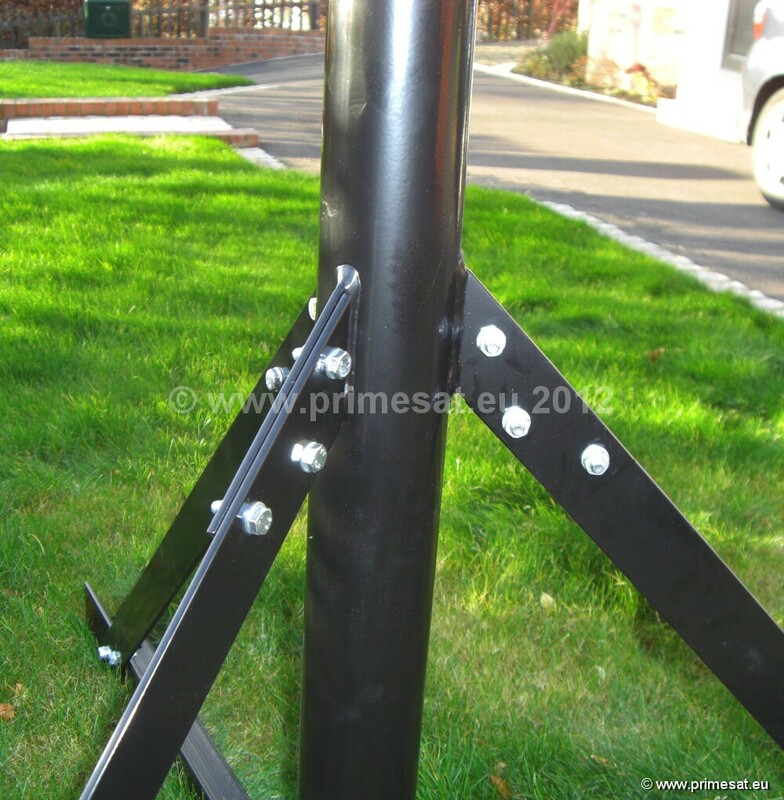 Primesat GS10016 heavy duty ground stand This stand is 1.6m high and has a 100mm (4.0") vertical pole. 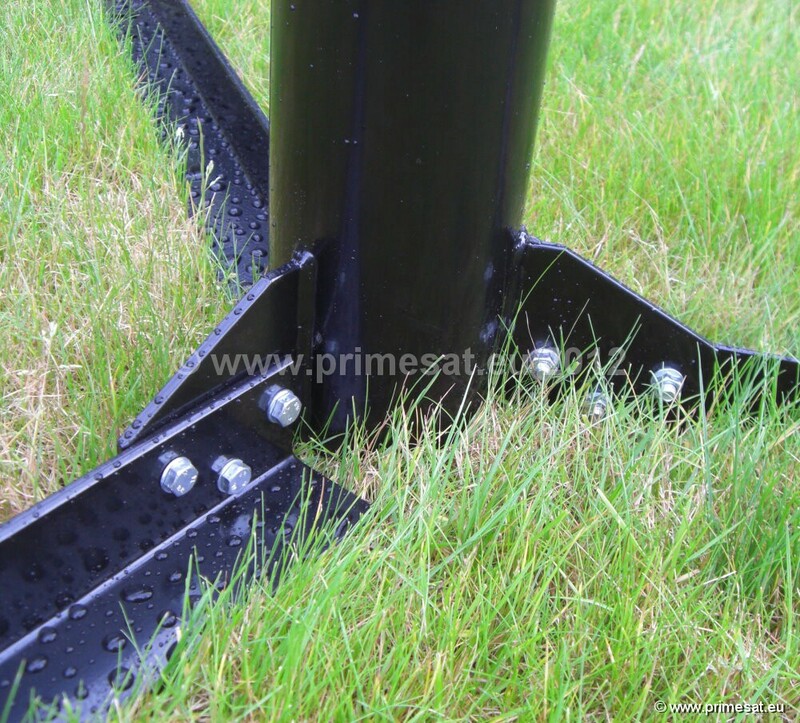 Heavy 6mm thick angle is used along the base and each of the steel 60mm by 60mm angles at the base are 850mm long. There are 24 holes for securing to concrete or paving. 8 holes at the end of each angle. The stand is etch-primed, primed and top coated black. The paint coatings are oven baked at high temperature for durability. Multiple bolts are used for maximum rigidity at all joints. Weight 65Kg. It is heavy but it needs to be. Since it is bolt together it can be easily transported or shipped internationally. Options. 1. Ballasts, total weight 88Kg, 2. Adjustable feet, 15 are needed. We have manufactured these stands since 1991. Pictures to be added soon but similar to GS65160 above apart from pole diameter. All other parts apart from the pole diameter are the same. hover over image to view in higher detail.